LEXINGTON, Ky. — Orange Leaf Frozen Yogurt will use only Udderly Kentucky milk in its frozen yogurt products in 11 Orange Leaf shops in Kentucky. 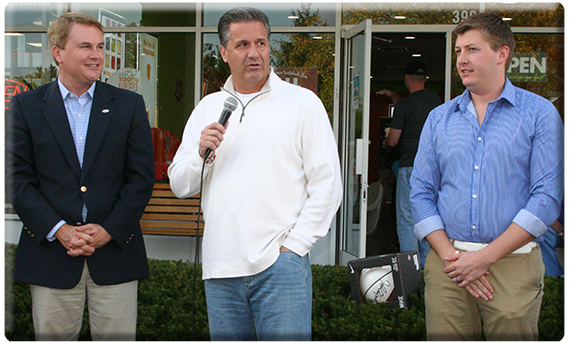 Agriculture Commissioner James Comer and University of Kentucky men’s basketball coach John Calipari made the announcement Tuesday at the Orange Leaf Frozen Yogurt Shop in Brighton Place Shoppes. Comer said participating dairy farmers earn a premium on sales of Udderly Kentucky milk that amounts to average new income of $19,000 per farm per year, $2 million in all. Udderly Kentucky milk is processed by Prairie Farms Dairy of Somerset, Ky. Commissioner Comer unveiled the Udderly Kentucky brand in July. To find out more about Udderly Kentucky, read about some of the participating producers, and find a location where you can buy Udderly Kentucky milk, go to www.udderlyky.com.